Busbridge Church built by Mr and Mrs Ramsden of Busbridge Hall, designed by George Gilbert Scott. Diverse soil types and rights of way are across Busbridge which is on foothills of the Greensand Ridge. A walking area is Winkworth Arboretum, with parking area pictured. Busbridge is a village and civil parish in the borough of Waverley in Surrey, England that adjoins the town of Godalming. It forms part of the Waverley ward of Bramley, Busbridge and Hascombe. It was until the Tudor period often recorded as Bushbridge and was a manor and hamlet of Godalming until gaining an ecclesiastical parish in 1865 complemented by a secular, civil parish in 1933. Gertrude Jekyll lived at Munstead Wood in the Munstead Heath locality of the village. Philip Carteret Webb and Chauncy Hare Townshend, the government lawyer/antiquarian and poet respectively owned its main estate, Busbridge House, the Busbridge Lakes element of which is a private landscape garden and woodland that hosts a wide range of waterfowl. The village's economy is bound closely to Godalming as the two settlements are contiguous, that is, the part of Busbridge where most of its residents live as it forms a scattered settlement, rather than a nucleated village. 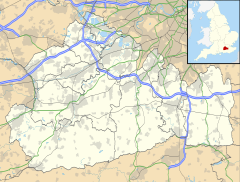 The latter large town is formed of six surrounding suburban villages, together with an urban centre with a railway station on the Portsmouth Direct Line which runs from London, diverging from the SWML at Woking, and bordered on the far side by the A3. Two occupation groups employed approximately half of the workforce at the 2011 census, namely: managers, directors and senior officials (78 workers) and professional occupations (81 workers). Busbridge Tennis Association is a community initiative which was fundamental in the process of renovating the tennis courts and recreation ground at the top of Holloway Hill and overlooking Godalming. In 2012 they secured £37,900 of Olympic Legacy Funding from Sport England's Inspired Facilities Fund for flood lights on all four courts allowing for expansion with junior tennis training. Based on the area recorded by the Office for National Statistics at the 2001 census to calculate population density, the parish covered 992 hectares (2,450 acres) – most of the centre and south-east of the parish is forested. Busbridge was wholly in the Anglo-Saxon hundred of Godalming, Surrey but had at the Domesday Book of 1086 no entries, being a rural, farmed part of Godalming and wooded part within the Weald, a remnant forest (partially intact) stretching into Sussex and West Kent. Upper Eashing or High tithing in the 13th century Hundred Rolls formed early Busbridge, as the name Busbridge began to be used after the medieval family came to own the manor, in the 15th century. They came from Kent, in 1384 first recorded here, as 'Burssabrugge' and 'Burrshebrugge'. Within Godalming's then large surrounding fields was other land, Bushbridges, farmed by them, however common fields which were enclosed, often still subject to limited common rights, in an Act of Parliament of 1803. James de Bushbridge sold Bushbridge or Busbridge to John Eliot of Godalming under Henry VIII. His grandson Laurence Eliot sailed with Drake round the world. His son William, born 1587, was knighted in 1620 and built the old house of Busbridge, to judge from the features of the building, and formed the park, having a (royal) grant of free warren in his lands of 500 acres (200 ha) in 1637, and died 1650. The heirs were son William (1624–1697) and then grandsons William, born (1671–1708) and Laurence, who sold the property in 1710. It passed through many owners. Among these was Philip Carteret Webb, FRS, born 1700, solicitor to the Treasury 1756–65, M.P. for Haslemere 1754–67. He was a distinguished lawyer, antiquary, and collector. He died at Busbridge in 1770. Chauncy Hare Townshend, poet, was born at the house in 1798, his father having bought it two years earlier. In 1911 less widely influential owner Mr. P. Graham owned it, however notably replaced it between 1906 and 1911 with a new house in the Edwardian (early 20th century) style. Accordingly, the Eliot family of Busbridge who owned the manor in the 17th century, for example, have many memorials in the contemporary parish church, St Peter and St Paul, in the centre of Godalming. The church of St. John the Baptist, Busbridge, is of Bargate stone with chalky limestone quoins, a central tower and windows. It was built in a 13th-century style, consecrated on completion in 1867. Its designer was George Gilbert Scott, it is accordingly Grade II* listed; it technically lies just over the civil parish boundary in the borders of Crownpits/Holloway Hill in Godalming. Busbridge gained an ecclesiastical parish in 1865 complemented by a secular, civil parish in 1933. This sparsely populated bulk of the parish has a minority of farmland but is otherwise part of the remaining area of The Weald, forming much of the green buffers between settlements in the south of the county. A small triangular park, Munstead Wood extends from the heath a small way into one of Godalming's outer six suburban localities, Holloway Hill. This is grade II* listed in the 'park and gardens' category, containing Gertrude Jekyll's landscaped woodland home see landmarks below. North Munstead is a hamlet sometimes marked on most detailed maps toward Hascombe. Its most notable location in the area is Winkworth Arboretum owned and maintained by the National Trust since after the Second World War. Tuesley is a hamlet of the village 300m west of the main settled corner of Busbridge, used for strategic meetings under the formative manor system developed by them. It is named for the Anglo-Saxon war-god Tīw and literally translates as his clearing (Tīwes lēah). This affirms the area as within the remnant Weald which is the Germanic Old English for a forest, where trees were cut and a temple to the god created. Sometime in 7th century, the temple was consecrated by Christians and a small chapel was erected. Tuesley appears in Domesday Book of 1086 as Tiwesle as a subsidiary manor of Godalming that rendered £2 to its overlord. It was held by Rannulf Flambard from (under) William the Conqueror and its recordable assets were: 1 hide and 1 plough and it had 8 households, one of which was a slave/serf. In 1220 the name was Tiwerlei. recorded in the Salisbury Register of St Osmund in 1220 as a chapel, still standing but in a ruinous state dedicated to the Blessed Virgin, the first church established in the manor, so known and recorded in Godalming records as "the mother church or the Oldminster" for centuries. By 1220, services were held only three times a year. A fair was held in the field on Lady Day (a quarter-day in the same cycle as Christmas) until 1540. The foundations of the "minster" were partly excavated in 1860 before covered up – only dry-stone walls and boundary posts mark the rectangle of the buried ruins. In 1956 Tuesley Court Farm was acquired by a Roman Catholic Holy Order and renamed Ladywell Convent by the Lady Well, part of the series of lakes forming much of the stream running through Busbridge, as part of this sale it acquired the earlier converted pagan sanctuary and erected a statue of the Virgin Mary. The convent is north of the stream and so, although associated with Tuesley Court, was a later addition and is not part of the hamlet or village, instead being still part of Godalming. A small linear settlement on a minor crossroad, Hydestile includes Busbridge Court Farm which strengthens its partial connection with the village, other than the ancient boundaries still used for the civil and ecclesiastical parish running to the crossroads. Hydon Hill, a Leonard Cheshire Disability hospice/retreat is in this part of Busbridge. Busbridge Church is an evangelical church, with significant growth since the year 2000, that runs four Sunday Services and activities usually every day. On a Sunday over 200 young people and children attend their youth and children's work. The main feature of Munstead Heath, which is a triangular woodland dotted with homes, is the Edwin Lutyens-built house (finished in 1897) of Gertrude Jekyll, one of the most important figures in gardening worldwide in the 19th and 20th centuries – this is Grade I listed. Busbridge Lakes is a grade II* heritage 16 hectares (40 acres) site or landscape (in the parks and garden special category) listed for its manmade follies, grottos, clear lakes and wide range of trees and extends into the informal area of Ladywell, Tuesley, part of which is publicly accessible at no charge, such as the smallest lake, Lady Well, and the modern dry-stone walling above an Anglo-Saxon pagan shrine to the god Týr or Tiw, see above. This consists of 3 lakes, nature trails and a wooded hillside containing a largest collection of wild waterfowl. The owners state the site has 130 species of swans, geese and ducks, many endangered, rare pheasants, cranes and other exotic birds. The landscape is open to the public on selected days, on private booking, open for schools, clubs and private parties. The village churchyard contains several significant memorials by architect Sir Edwin Lutyens, who also designed the house at Munstead Wood for his friend and collaborator Gertrude Jekyll. Lutyens designed Busbridge War Memorial, a grade II* listed structure, unveiled in 1922, one of dozens of war memorials around England and elsewhere after the First World War and one of fifteen of his War Crosses, which all share a similar design. The names of the village's war dead are listed on a plaque inside the church. He also designed memorials to Julia Jekyll (Gertrude's mother), Francis McLaren, and a joint memorial to Sir Herbert Jekyll (Gertrude's brother) and his wife Dame Agnes Jekyll, and to Gertrude herself. Under United Kingdom Census 2011 the population stood at 21 higher than ten years earlier, living in 267 households. The oldest censuses provide population figures which are inaccurate for direct comparisons, due to land losses to Godalming in the 1950s, which caused the population 'to decline' from 1,458 in 1951, to 1,039 in 1961 in line with the area lost to the adjoining town. Depending on whether a given place is in the north or south of the parish the nearest stations are Godalming and Milford respectively. These are approximately 2 miles (3.2 km) from the western side of the village and on the Portsmouth Direct Line. The area is on three mid-distance local roads converging on the south of Godalming, each scaling the wooded slopes of the Greensand Ridge; none are dual carriageways. The main, central one of these reaches to Pratt's Corner in the parish of Dunsfold. ^ "Busbridge Tennis Association". Archived from the original on 29 July 2013. Retrieved 26 April 2012. ^ "Busbridge Tennis Association News". Archived from the original on 29 July 2013. Retrieved 26 April 2012. ^ St John the Baptist – Grade II* – Historic England. "Details from listed building database (1352706)". National Heritage List for England. Retrieved 14 October 2013. ^ Munstead Wood – landscape – Historic England. "Details from listed building database (1000156)". National Heritage List for England. Retrieved 14 October 2013. ^ Historic England. "Details from listed building database (1005943)". National Heritage List for England. Retrieved 14 October 2013. ^ a b Scheduled Ancient Monument Former St Mary's Church site Historic England. "Details from listed building database (1005943)". National Heritage List for England. Retrieved 14 October 2013. ^ "Busbridge Church Youth and Children". Archived from the original on 13 September 2012. Retrieved 26 April 2012. ^ Busbridge Wood (House) – Grade I – Edwin Lutyens – Historic England. "Details from listed building database (1261159)". National Heritage List for England. Retrieved 14 October 2013. ^ Historic England. "Busbridge War Memorial (1044531)". National Heritage List for England. Retrieved 27 February 2016.